For many individuals, using a dishwasher makes washing dishes incredibly simple as dishwashers are able to hide all of the dirty dishes away and out of sight. As a result, dishwashers are able to make your kitchen look cleaner instantly. Simply put, having a dishwasher saves a significant amount of time and they usually do a better job cleaning your dishes. Before placing any dishes in the dishwasher, be sure to check each item in order to confirm that the items you are placing in the dishwasher are suitable. For example, you will often see that many kitchen items have washing instructions on the bottom or on the inside of the dish. Some items may say “dishwasher-safe” or “top rack only”. It is crucial that you follow these instructions or you may ultimately end up with melted plastic or warped kitchen items. Depending on the size of your dishwasher, it may not be recommended to place large saucepans or pots into the dishwasher as these kitchen items tend to take up a lot of space. It is usually suggested to hand-wash these items so that your dishwasher may have enough space for more smaller items. Always be careful when placing plastic items in your dishwasher. Most plastic cups or plates will be labeled as dishwasher-safe; however, if it does not specify whether or not the item is dishwasher-safe, it is usually best to hand-wash the item. The last thing that you will probably want to do is to spend over an hour scraping melted plastic out of your dishwasher. As obvious as this may seem, it is extremely vital that you keep firearms and flammable objects out of your dishwasher. Although it may seem easier to just throw these items in your dishwasher to clean them, it is highly dangerous and they could potentially damage your dishwasher. In fact, they may even end up harming you and/or your family. Despite the fact that all of these things are obvious, it is surprising how many individuals need to be reminded how to properly use a dishwasher. By keeping these things in mind, you will have cleaner dishes and will save yourself valuable time. 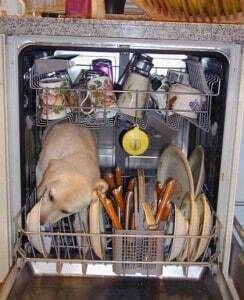 Contact C&W Appliance Service if you need to schedule an appointment with a dishwasher repair technician. We proudly serve the Dallas, Fort Worth and San Antonio area.